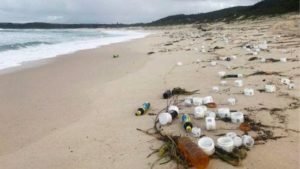 Large amounts of rubbish have washed ashore in Australia after 83 shipping containers fell from a vessel in the Tasman Sea. The cargo tumbled off a Taiwanese-owned ship in a heavy swell off the coast of New South Wales last Thursday (31 May). Locals have complained that rubbish continues to wash up on usually spotless beaches. Authorities say that the debris is not poisonous, but it may take some time to clear. “There has been mountains and mountains of rubbish and debris washing in,” one volunteer involved in the clean-up, Julie Simms, told Nine News. Material from the containers began washing up on Sunday, after the vessel YM Efficiency was struck by bad weather about 30km (19 miles) from shore. Taiwanese shipping company Yang Ming Marine Transport Corporation has apologised for the incident. “We know that the marine incident has brought a lot of public concern,” spokesman Steven Ka told the Australian Associated Press on Tuesday. The clean-up effort is being co-ordinated by the state’s Roads and Maritime Services. About 100 workers are expected to remain combing the beaches until the end of the week. Executive director Angus Mitchell said crews had removed five skip bins worth of rubbish from one beach alone. “This continuing environmental pollution and recovery effort is our highest priority,” he said. A Video showed some containers split open and hanging from the ship. Although the products are not toxic, officials said some items could be harmful for sea life if they are swallowed. Maritime authorities have issued hourly warnings to leisure boats and commercial ships about some metal containers which remain partly submerged. The YM Efficiency was en route from Taiwan to Sydney when the accident happened.